Sunset Hill Stoneware has the most dedicated, skilled employees of any pottery company in America, and it shows in the quality of the custom coffee mugs and handmade beer steins we produce. They care about every detail of your stoneware, from when they start out as simple lumps of clay to the time they arrive at your door as personalized mugs or steins. Here is an in-depth look at the skilled artisans whose hands and minds help create your stoneware. All of these talented individuals work at our shop in Neenah, Wis. 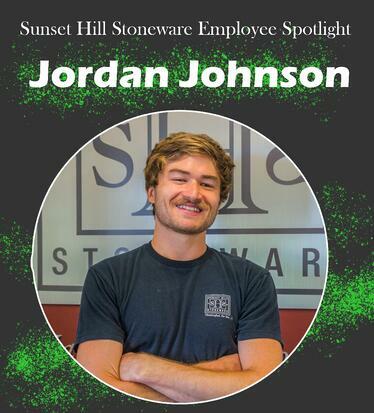 This blog will be updated periodically with new profiles of Sunset Hill Stoneware's potters, glazers, shippers and more as we publish more Employee Spotlights. Every potter at Sunset Hill Stoneware put a part of themselves in the stoneware pieces they create. Inside your mug or stein, the subtle grooves you feel and see come from their fingertips as they shape the clay into its elegant final form. However, their talents and stories extend even further beyond the pottery you have in your hands. 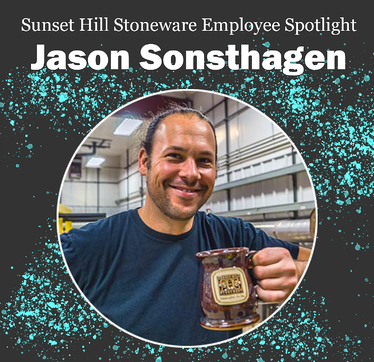 The brains behind our production operations, Jason Sonsthagen is a master potter who has been working with Sunset Hill Stoneware for more than 20 years, before he was even out of high school. In addition to being a master, an Ironman triathlete and an all-around good person, Jason has also taken on some unique projects for us in the past that go beyond even our wide selection of mugs and steins. Some of his more unusual endeavors with us include giant mugs, unique stoneware trophies and customized coffee mugs for local individuals with rare genetic conditions. 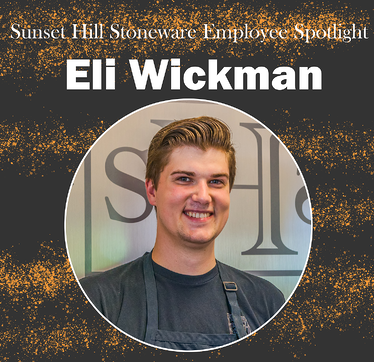 Originally a member of our shipping team, Eli learned how to throw and became one of our artisan potters. However, when he finishes washing the clay from his hands at the end of the day, Eli gets his hands dirty with something else: sawdust. He creates woodworking pieces with both purposes and artistry. If you look at the base of the handle on your stoneware coffee mug, you'll notice an indentation shaped like a thumbprint. That thumbprint comes from one of our handlers, who ensures that your stein or mug's handle is secure before it goes any further in its journey. These craftsmen also place your medallions on the customized mugs and steins and make sure they are centered before allowing the stoneware to dry prior to bisque firing. On the base of every handle that Sunset Hill Stoneware makes for its stoneware coffee mugs and beer steins, you'll find a thumbprint where our artisans have attached that piece. 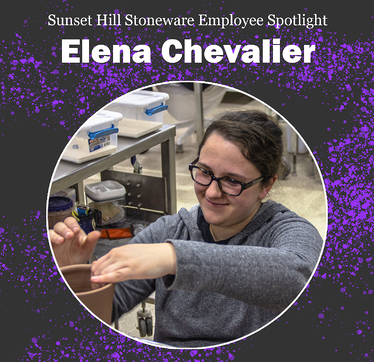 One of the people hand-applying your handles and medallions is our own Elena Chevalier. Elena has worked in our handle and medallion application department for almost two years. She's all too familiar with the work that goes into handcrafting your mugs and making them like no other. The glazing team is responsible for your mug being as beautiful as it is, whether you ordered mugs in a natural clear glaze or one of our bolder colors like Moonberry or Pistachio. They help ensure your mugs will be durable enough to last through years of potentially daily use. However, our glazers are also part of our team of mad scientists—there's no telling what new glaze combinations they'll concoct next! A lot of behind-the-scenes work in our firehouse goes on before your mugs are fired at temperatures exceeding 2,000° Fahrenheit. 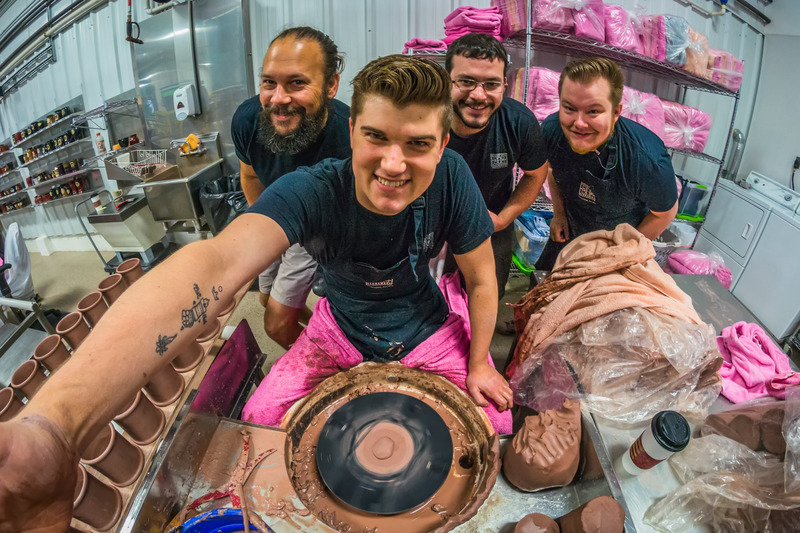 Here are some of the crew members who prepare your mugs for firing and what they do when they're not creating specially coffee mugs with logos and other custom artwork. Jordan Johnson started out at our prep and finish station, sanding the bottom of our mugs for a smooth finish. He's now starting to throw stoneware mugs with our potters and glazing mugs as well, but in his free time he's made a name for himself with Jackson Pollock-style drip paintings that have been displayed in area coffee shops. After your mugs are fired for the last time and ready to go out into the world, our inspection team makes sure that your mugs pass our rigorous quality control standards. If they meet our requirements for size, weight, ounces and more, they're sent to our shipping department to be mailed to you. Our shipping department makes sure your mugs are packaged safely before we send them to you. However, when they aren't running a tight ship with our orders and using our custom packaging to protect your mugs, our shipping department follow their own creative endeavors after hours. Sunset Hill Stoneware's graphic design department adapts every piece of artwork that goes onto your mugs and steins. Whether your artwork is sleek and simple or full of fine details, this dedicated creative team can bring your unique ideas and designs to life. Liz Babicky, our sole graphic designer, adapts thousands of designs each year into our mug medallions. 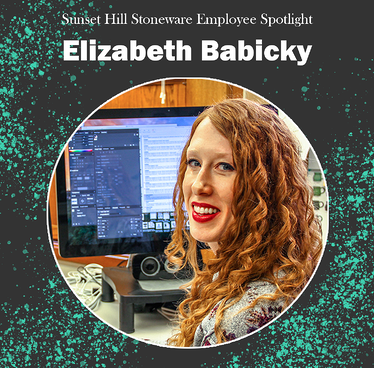 A jack of all trades in the art world, Liz not only adapts your artwork onto our mugs, but regularly develops original designs for Sunset Hill Stoneware as well. However, when she's not showing off her mug design skills, she has also made a name for herself with hand lettering and is venturing into the world of beekeeping.